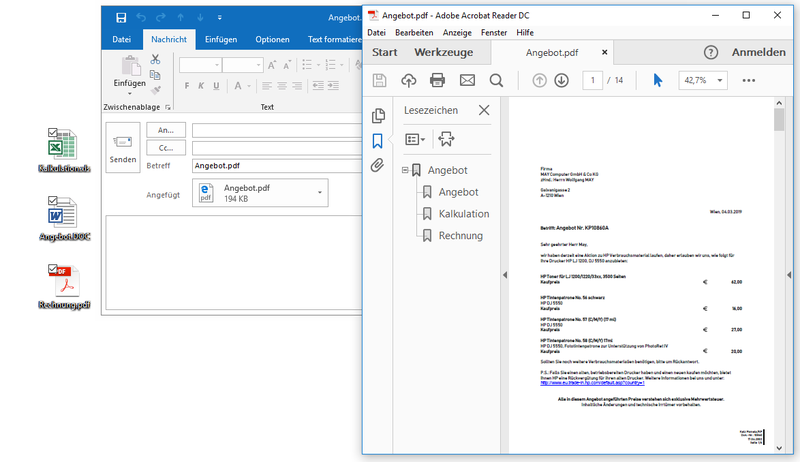 PDF News - PDF/A, Archivierung, OCR, DMS, Dokumentenmanagment, Scan to PDF, ECM, PDF Convert, Free PDF printerdriver, freier PDF Druckertreiber, SDK, API, PDF softwaredevelopment | Distribute, publish and archive documents. 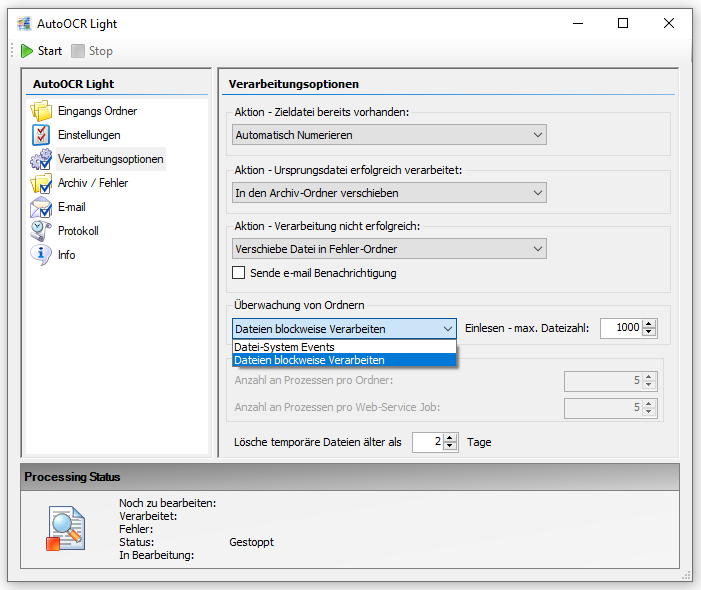 The iOCR Standard OCR component of AutoOCR / AutoOCR light is now based on the new Tesseract OCR Version 4.0. 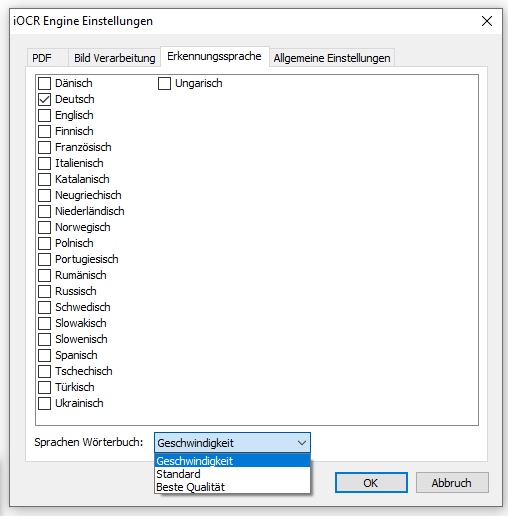 Multiple languages can be selected for OCR recognition. Additional option to select OCR accuracy / speed. Configurable parameter for splitting documents into smaller single documents to handle large page number documents with small / limited memory resources. Conditional OCR processing – via file format, page number, page format – width / height in mm or pixels, resolution, file size and color depth – configurable for folder monitoring and web service processing. 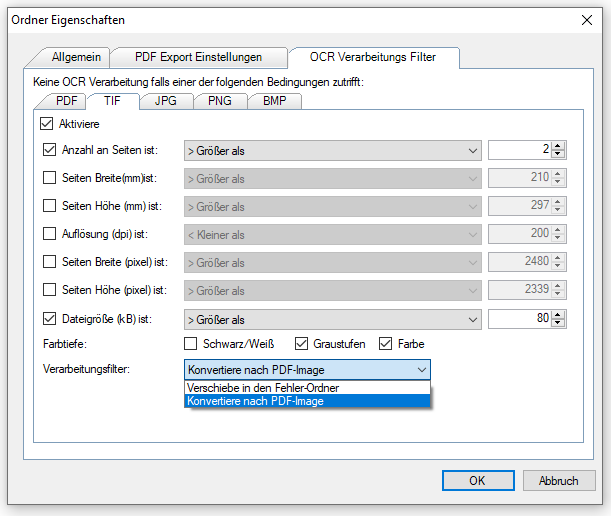 This can be controlled by file format per criteria – whether an OCR processing or conversion to a PDF image or whether the OCR processing of such files should be blocked. This can be prevented that the OCR processing is blocked by “meaningless” processing. for example if large JPEG photos get into the OCR processing process and handwriting recognition makes no sense. For the update of the AutoOCR light version 1.x to 2.x a new license is required. An application to monitor folders. For example AutoOCR / AutoOCRlight and so on, there are options that determine how the files are recognized for processing from the folders and when their processing is started. An operating system function is used to detect changes to files as well as new files in a folder / folder structure and to start processing immediately. This option should only be used for local folder / folder structures, but not for processing network shares. The folder is read in “block by block”. That It always blocks in the set maximum number of files are read in and processed. After processing a “block” the next “block” starts etc. until all files have been processed. If no further files are found then the folder will be every 10msec. asked for new files. The “blockwise processing” should be used for folder monitoring of network drives. The processing of a newly detected file usually starts immediately, but there may also be reasons to delay the processing. For each watched folder, there is a setting to delay the start of processing by x seconds. First, the set time is waited in seconds and then processing is started – see also >>> – After the delay, the files to be processed are checked whether they are already free and not read-only. Here again max. 10sec. waited for the release of the file. 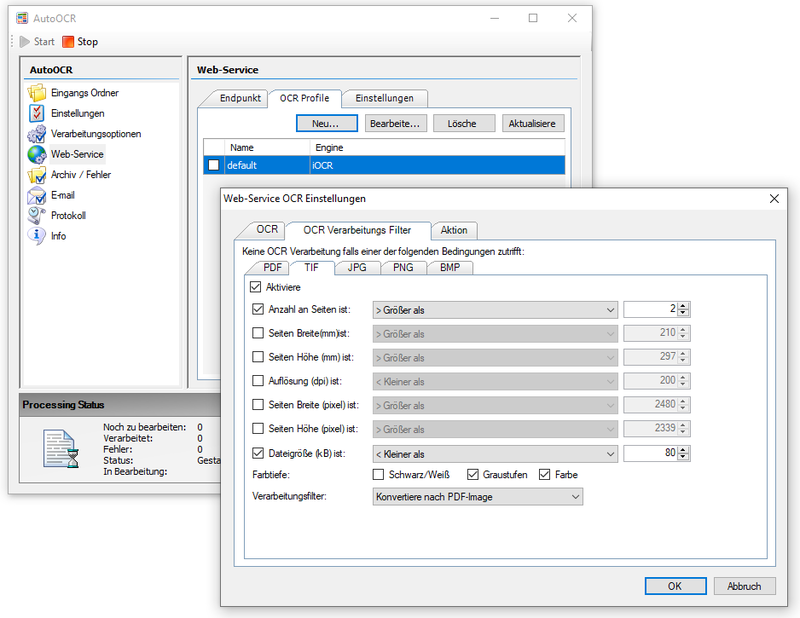 With the FCpro installation starting from the version 1.0.86 certain installation requirements are checked – if they are fulfilled then these installation steps are skipped by the setup and not executed. If these components are already installed, they will not be reloaded and only FCpro will be installed. If an installation without internet connection is to be made, the setups of the components should be downloaded in advance and installed in this order. The FCpro settings and the license are retained during the uninstall / update to the new version. If a user account was used for the Windows service, it must be reconfigured after updating to a new version – User / Password / Domain will not be retained. FCpro’s iOCR Standard OCR component is now based on the new Tesseract OCR version 4.0. This makes it now possible to recognize documents with multiple languages. Multiple languages should only be activated if required, as each additionally activated language increases processing time accordingly. Option to select OCR accuracy/speed – There are 3 different recognition profiles available for OCR detection – “Speed / Standard / Accuracy”. By default, the “Speed” profile is preset, which in this selection corresponds to the OCR recognition accuracy of that of the previous version. “Standard” and “Accuracy” bring improvements in OCR recognition quality to the previous versions, but take longer to process than the “Speed” profile. However, different settings can be preconfigured and easily and quickly switched using the FCpro processing profiles. The new version of iOCR will be installed as “vsOCR4” in version 1.1.4 via the FCpro setup. This results in a new FCpro installation requirement. iOCR now also requires the “MS Visual C ++ 2015” instead of the “MS Visual C ++ 2005” runtime. The presence is automatically checked during installation and installed if necessary. 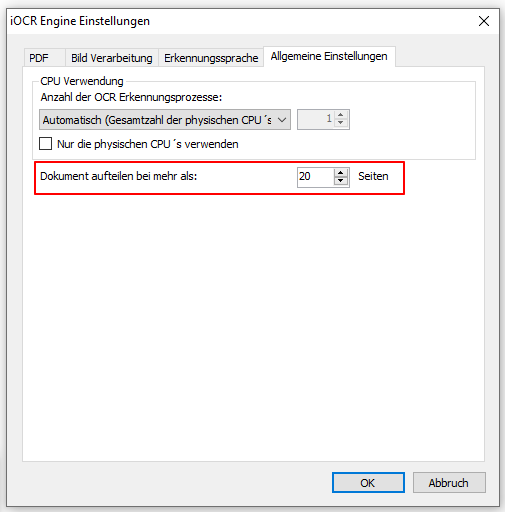 Configurable parameter for splitting OCR documents with multiple pages: During OCR processing, the iOCR component loads the document to be processed completely in the main memory. In this case, e.g. a 500 pages Black&White, 300dpi document needs about 1.2GB of main memory. However, FCpro can also run several processes in parallel, which can quickly run out of resources depending on the configuration and size of the documents being processed. 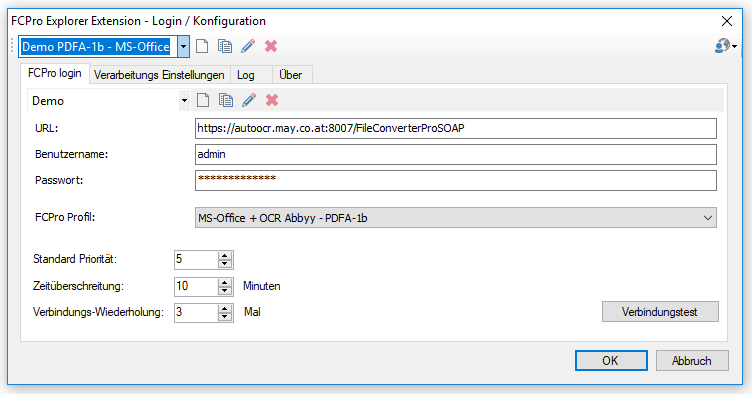 In order to be able to better control the required resources and their distribution to several parallel processes, it is possible to specify via a parameter from which number of pages for OCR processing a document automatically splits, processes the sub-documents seperately and finally reassembles it into a complete document. This results in e.g. with 2 cores/CPU and 4GB RAM = 2*5 + 2*5 = 20 as default value, which can be changed individually. Advanced options for conditional OCR processing: The OCR conditions can now be set individually for each file extension. In addition, the file size (in kB) and the color depth (Black&White, grayscale, color) can be used as criteria. For multi-page file formats (PDF, TIFF) the criteria are checked based on the parameters of the first page. 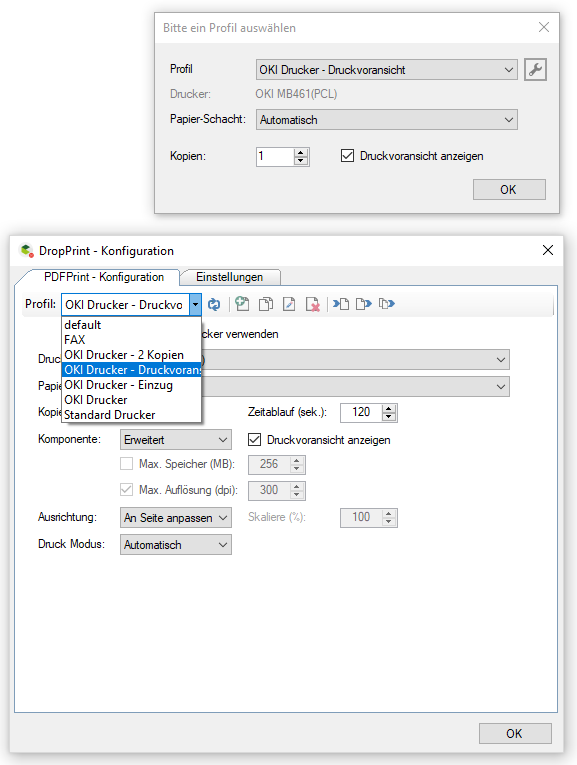 DropPrint is an executable MS-Windows printing application that can be started automatically. 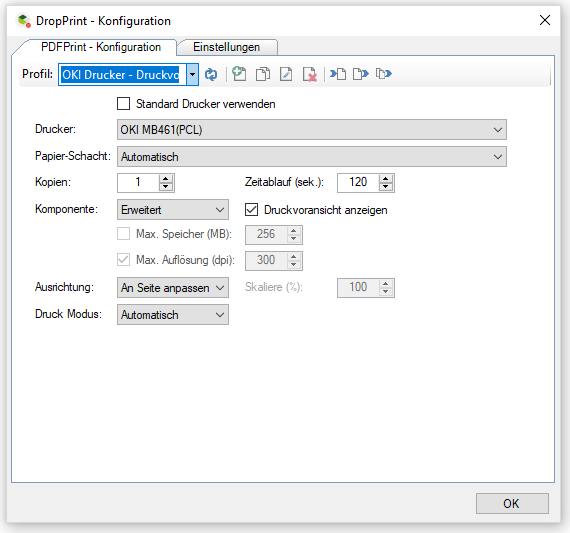 DropPrint makes it possible to print several PDF documents at once directly via Drag&Drop or via a monitored folder to printers – locally or via network. 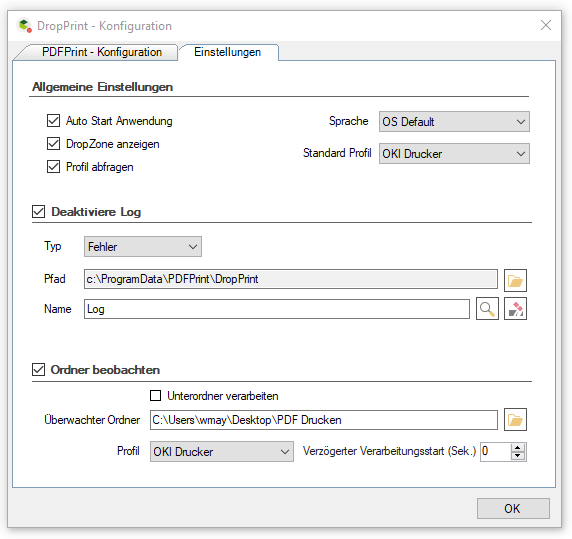 DropPrint is based on our PDFPrint – C#/.NET Component and does not require any additional application such as Adobe Reader, etc. The FileConverterPro (FCpro) provides a central service for converting many document formats into PDF or PDF/A via its web service interface. 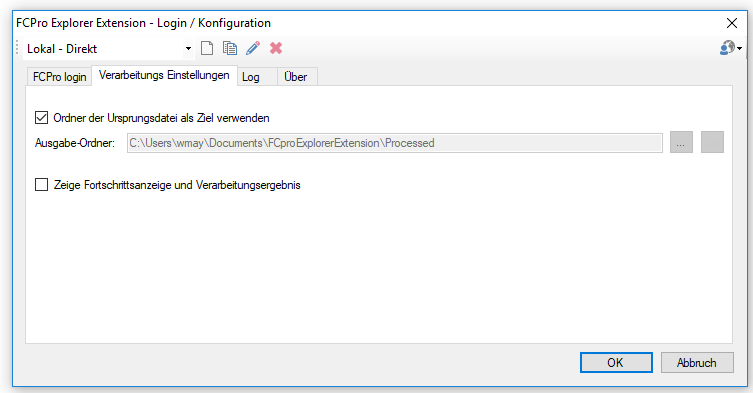 The FCpro Explorer Extension (FCpro EE) is a free Windows client application available for the FCpro converter. 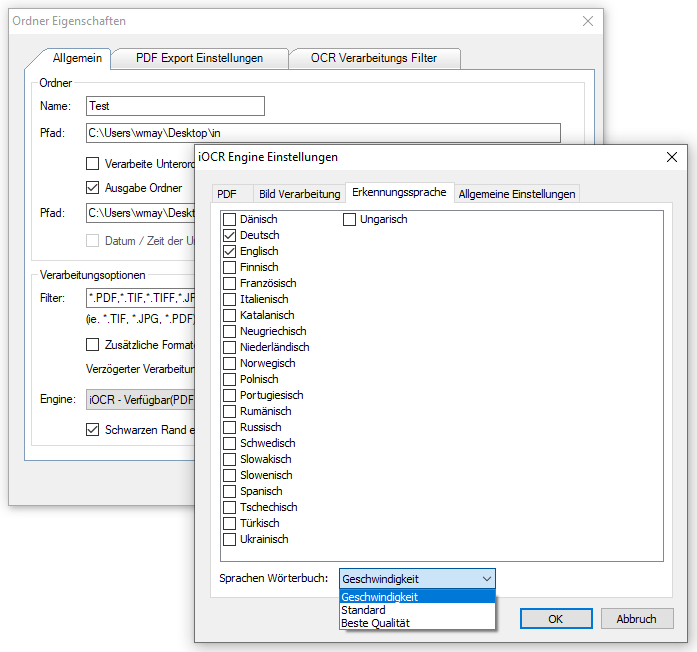 The FCpro EE integrates MS-Windows clients, via the context menu in Windows Explorer, with the FCpro PDF conversion service and enables easy and direct PDF(/A) conversion for a variety of documents and container formats. Free MS-Windows client application available for the FCpro. 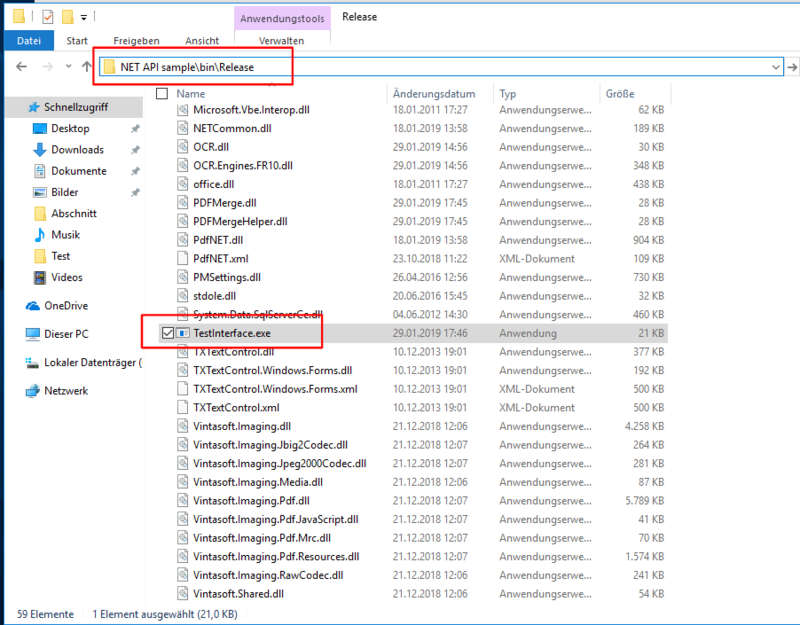 PDF or PDF/A – conversion is provided via the file context menu in Windows Explorer. Documents can be converted individually or merged into a PDF total file. 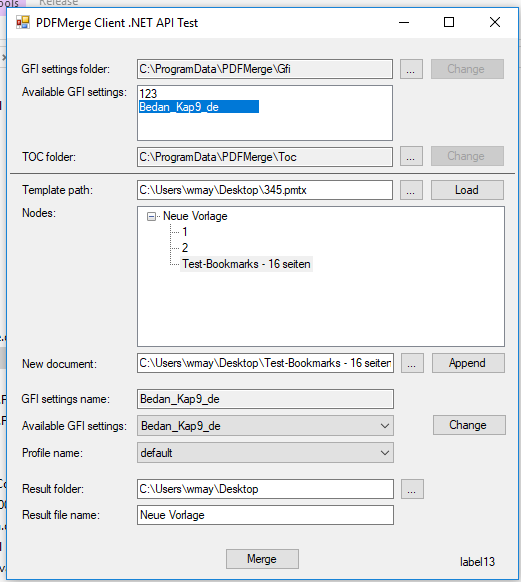 Pre-editable bookmarks are added to the individual files in the overall PDF file. 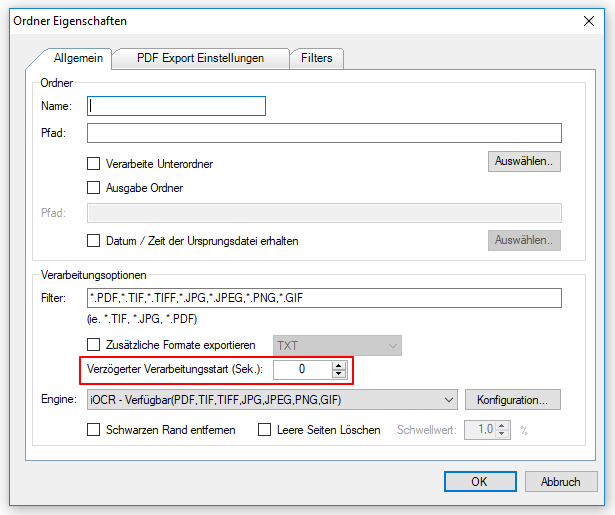 The order of the individual files in the PDF total file can be set/changed interactively. 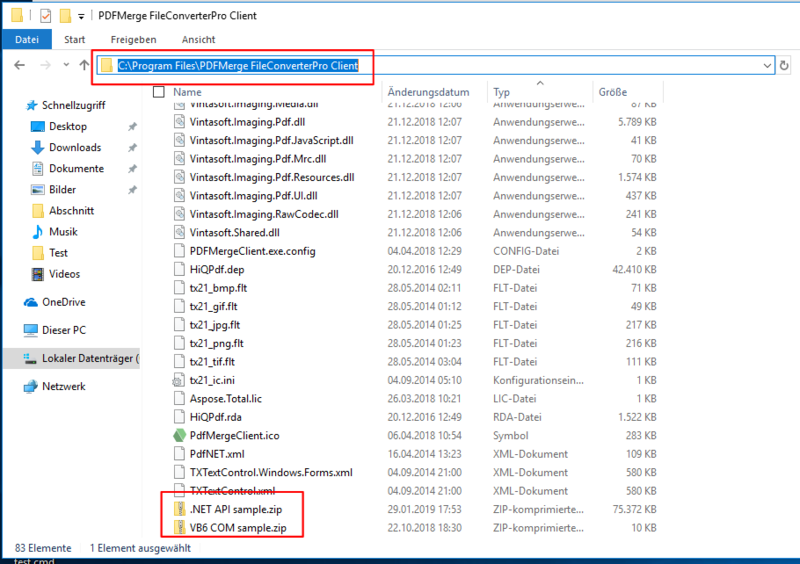 The PDF’s can either be stored in a specified output folder or in the same folder as the source file. As an alternative to filing in the file system, the PDF’s can also be inserted directly as an attachment in a new email message. Settings can be managed via profiles. 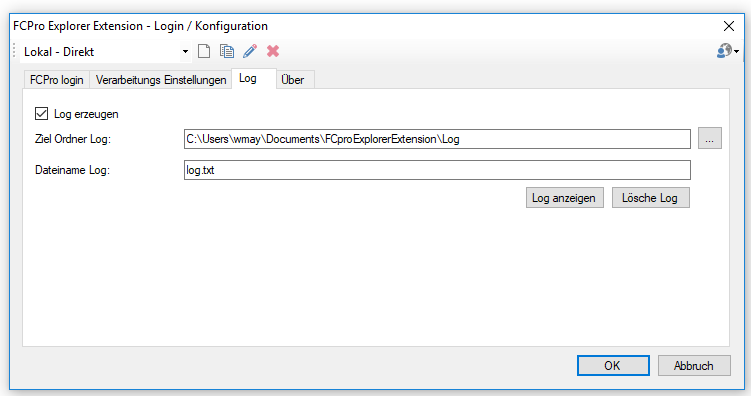 .NET / VB COM – Programming interface with example applications in source code and as executable example application. New Commandline-Option: /gfi=<none> or /gfi=<keine> to avoid applying a PDFExport profile. Requires FCpro version 1.0.83 or higher. PDFPrint Service CS Version 1.1.6 is now based on the latest PDFPrint .NET component. 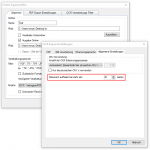 PDFPrint Service CS requires .NET Runtime 4.6 as of version 1.1.6. The setup checks if this version is present and if not it will automatically be downloaded and installed from the internet during the installation process. .NET 4.6 Runtime is already available with Windows 10. 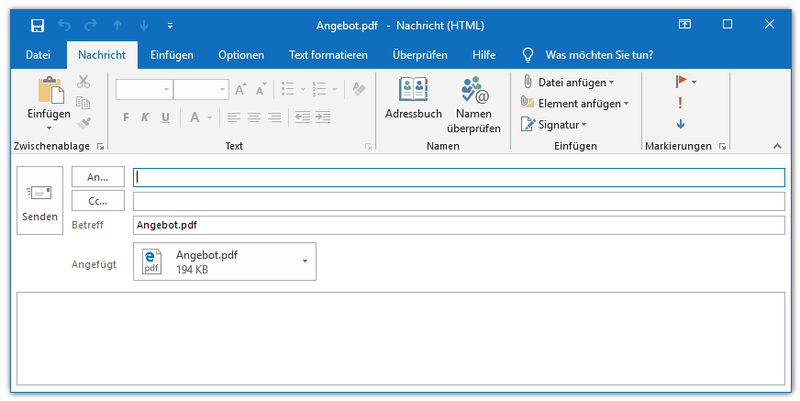 Based on the PDF to DOCX (PDF2DOCX) Component, the eDocPrintPro Plugin DOCXConverter is now also available. 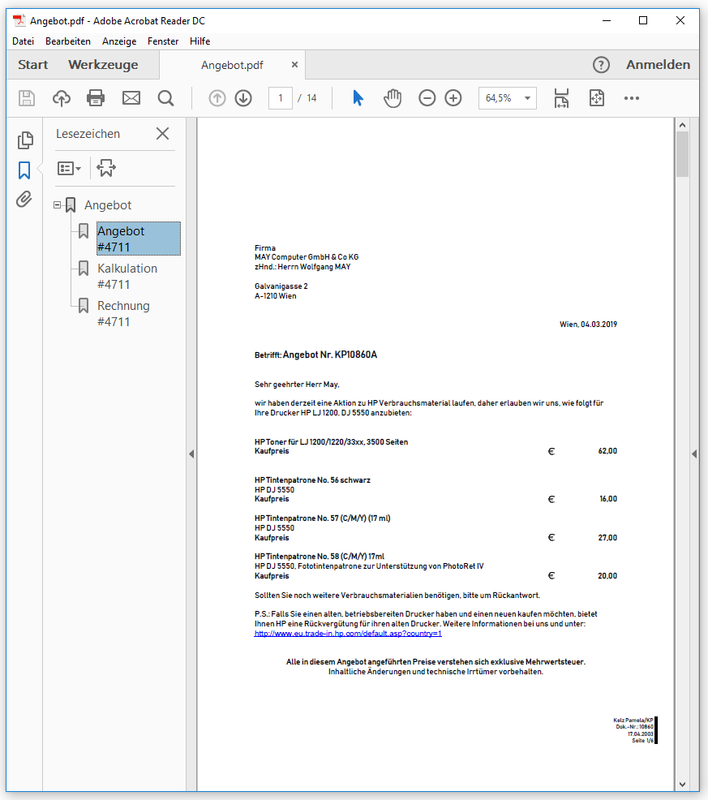 In addition to the PDF, other editable document formats can be generated during printing from any application. 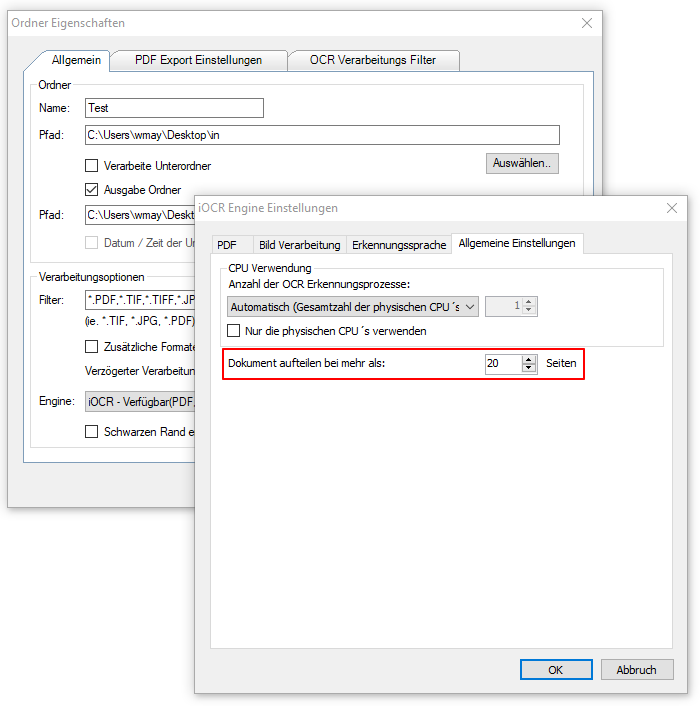 Converts the PDF print output into editable MS-Office documents. 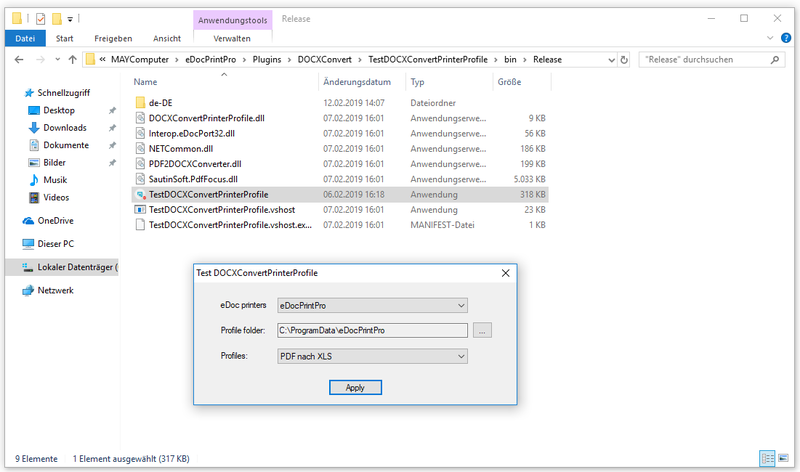 Executable sample application including source code to select and load the DOCXConverter profiles externally.